The important thing with the Rasmussen poll isn't it's level (tends to lean right) but is it correct about Trump's approval trending up? We've seen a similar upward trend in Trump's #s in other polls. Every day that goes by in which people realize it's been over a year and the world hasn't ended is a day in which people start to approve of Trump. If he actually has a major breakthrough with NK, look out! Talk about lowering the bar of expectations! Talk about utter delusion=The Trump is Hitler crowd. President Park: Impeached and sentenced to 24 years in jail. Will Trump ever be impeached? It'd be a miracle. And I really hope so. A man can dream, can't he? I had a meeting with my co-teachers while the election results were coming in. We were all just staring at our phones and being like "What is happening right now..."
Trumps popularity is on the upsurge. And what can the democrats run on? Higher taxes? Illegal immigration? Gun confiscation? Mark my words. They'll put in someone crazy like Pocahontas as their candidate. Trump will probably win again because of liberal stupidity. Environmental protection. Free trade. Balanced budgets. Reduction/elimination of gerrymandering. Lower sentences for nonviolent drug crimes. Dignity. Intellect. Cooperation. Health care, clean water, social security, prescription drugs, opiods, maybe a farm bill. There's a lot Dems can run on and win if they go with a sensible platform. The Democratic establishment has gone way too far on the identity politics train no way they are going to go back to a "sensible" platform in time for the 2018 midterms, couple that with the fact that most midterm elections tend to favor the Republicans anyway. Also tie that into the fact that the Democrats would essentially have to purge the extremist elements out of the party that thinks the only way to win is to tout someones racial or class status and go "OH look a black person, Hispanic person, Gay person, transgendered person... don't you want to elect them? Don't you want to look enlightened and compassionate? If you vote for our candidate you will and if you don't you're a racist, homophobic, Misgonist, transboic Nazi" Of course that is a bit hyperbolic but seriously that seems to be the democratic strategy. Ethier that or run a socialist hack like Bernie who goes down great with millennial democrats who all apparently failed basic economics and history. The Democrats need a serious internal shake-up that puts moderate Democrats back in the reins of power. I doubt that will happen before the midterms. I think It's likely you will see little change in the makeup of the house or senate. Its really hard to tell because most media outlets are more interested in cheerleading for one side or the other rather than doing actually unbaised reporting and reaserch. Ever hear of Conor Lamb? Doug Jones? The Democratic establishment has gone way too far on the identity politics train no way they are going to go back to a "sensible" platform in time for the 2018 midterms, couple that with the fact that most midterm elections tend to favor the Republicans anyway. - if you're white, you're good, unless you're a liberal, then you're bad. - if you're a minority you're probably bad, unless you kowtow to white conservatism, then you're good. - if you support abortion and/or don't want the country to be lied into wars, you're very very bad. - if you're a huge racist douchebag conman from Queens, you should be given the benefit of the doubt and desperately defended as the greatest and most noble statesman of all time. - if you are a woman who dares to run for president as a Democrat, you are literally SATAN!!!! President Trumps personal lawyers office and home was raided by the FBI. Tic tock...tic tock. If Trump is innocent then why is he acting like the most guilty person EVER? In other news...appointing Bolton is a sure fire way to start a war. Maybe that'll be enough to get the heat off this criminal. 2013 - "No, dopey, I would not go into Syria, but if I did it would be by surprise and not blurted all over the media like fools." 2013 - "Why do we keep broadcasting when we are going to attack Syria. Why can't we just be quiet and, if we attack at all, catch them by surprise?" 2013 - "For the first time in the history of military operations a country has broadcast what, when and where they will be doing in a future attack!" 2013 - "In war, the elememt of surprise is sooooo important.What the hell is Obama doing." 2014 - "What other country tells the enemy when we are going to attack like Obama is doing with ISIS. Whatever happened to the element of surprise?" 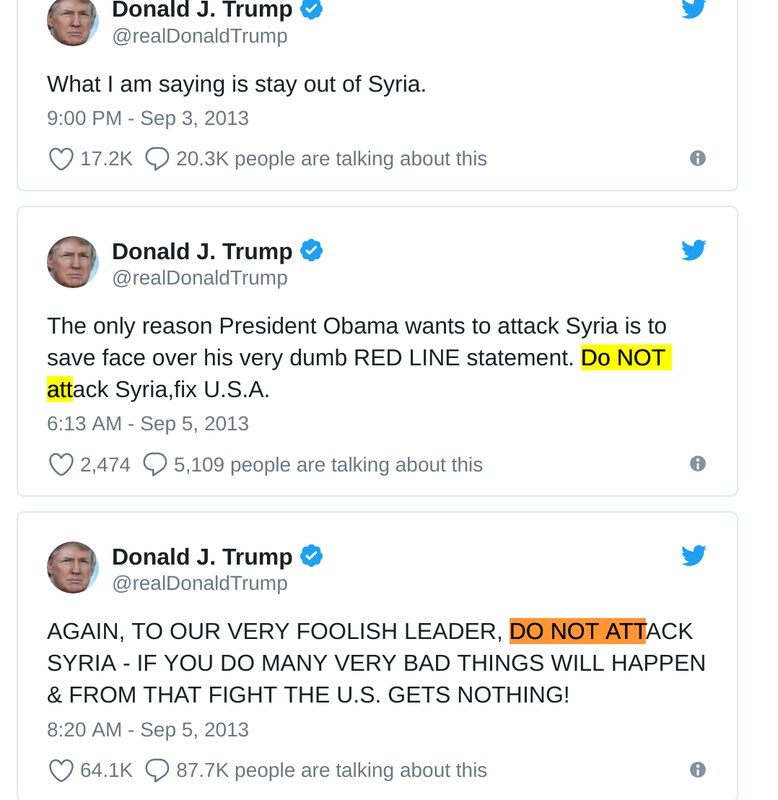 Just like last time Trump attacked Syria. Give enough warning to Russia so they can move their military hardware out of harms way. Perhaps it's fair enough to acknowledge that it's easy to shoot your mouth off and play arm chair general when you don't have responsibility for anything. As was the case for Trump back in the days when he was just a reality TV show host as apposed to the present day reality TV president. sparking a wat with out main nuclear rivial? As opposed to not giving warning to Russia, killing Russian troops, and possibly sparking a war with our main nuclear rival? Compared to Bush(both of them), Obama, and Clinton, Trump has actually proved capable. I'm just a little angry that he's getting sucked into this Syria trap.